I have a problem, though. This is a rare piece of clothing and there presently isn't a good pattern of it. Since I like to research sewing patterns, I've been working on a solution. I have found a pattern that will help me produce this uniform! The pattern is complete, but it is missing the instructions. 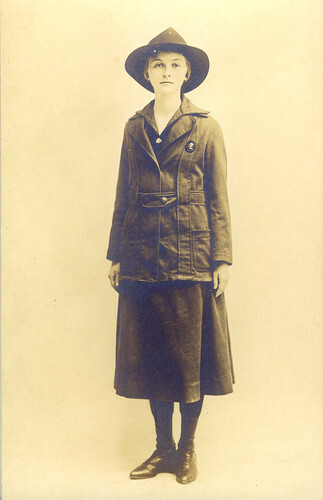 This is the "Official Yeowomen's Costume of the US Navy" circa, World War 1. 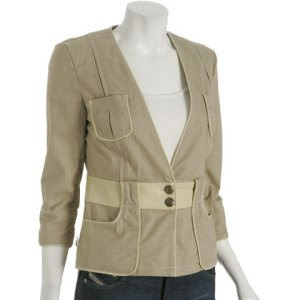 I'd say it is a close match to the Girl Scout uniform pictured above. Can you help me in my quest? Do you have the instructions to this pattern (Butterick 1101) in your private vintage pattern stash? Where would you wear this uniform? The pattern shown above is owned by Past Patterns. Please go to their website to inquire when copies of this pattern will be available. For more information about this uniform, I found the Blue Book of Rules for Girl Scout Captains. Published 1924. This is a scan of Elanors Parkshust's book. That woman saved everything! My council has her two of her uniforms, her membership cards, scrapbook, handbooks, and hats. What a wonderful snapshot of the Girl Scouts in the 1920s! 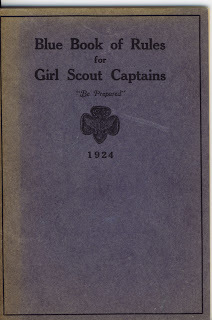 It contains detailed information on the official Girl Scout Uniform for the year 1924. 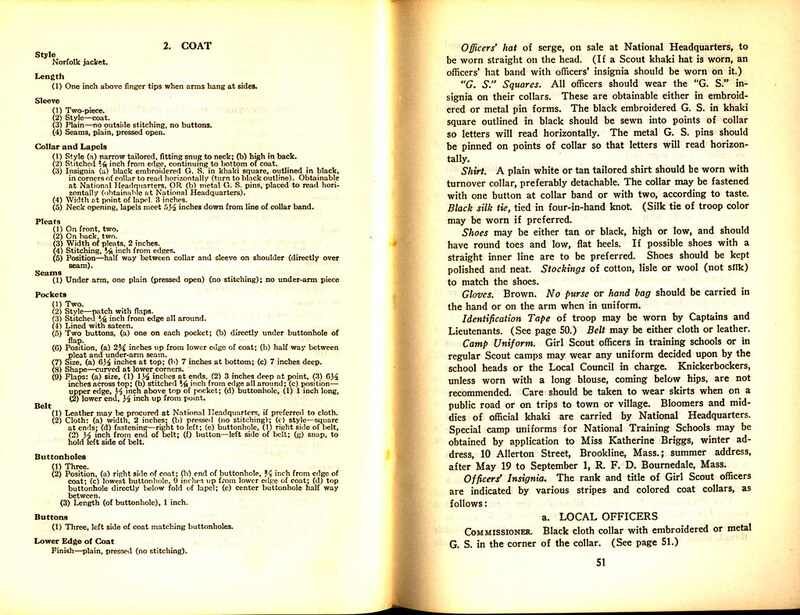 To see more pages from that handbook. Please visit my flickr site. Finally an update to this project! Please check out Pattern 126 at Past Patterns website. Wow. So I'm not the only one interested in the old uniform. I have actually seen the original patterns from turn of the century. Very similar to what you have shown. Try girlscoutmuseum.com for more info. I finally found a collector who is a major GS historian who wants to help me recreate. She might be too much of a stickler for accuracy for me tho. I just want to have our girls march in the parade in centenial garb. I don't really care about the thread color. I am wondering if you were able to sew a uniform that ou liked and if the Butterick Pattern worked out! The pattern is still not published. Please continue to contact Saundra Altman at Past Patterns: merchant@pastpatterns.com to inquired about the pattern. The more people she knows who want the pattern, the more likely she is to complete the project! Your WWII pattern probably has a zipper in the skirt, which was not around in 1918. Try Folkwear (www.folkwear.com) for their Walking Skirt. If you have a large waist, you may need to double the side panels in order to have enough to gather into the back pleats. Their Bathing Beauty has the right bloomers (camp wear), but the top is off. I haven't found a good top pattern, I'm going to draft one myself for the 1912. 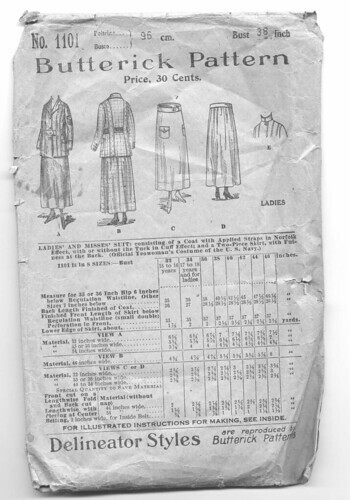 The pattern listed above is a World War 1 pattern - and Does not have a zipper. This is the Norfolk Jacket worn by Captains and Lieutenants. You can get a 39 page history and pattern instructions from the Juliette Gordon Low Birthplace (Savannah, GA). Email and ask for Katherine Keena - her area is historical uniforms. Thank you for getting the pattern published! I'm confused, though: the pattern you have above is a Butterick suit with aNorfolk jacket. 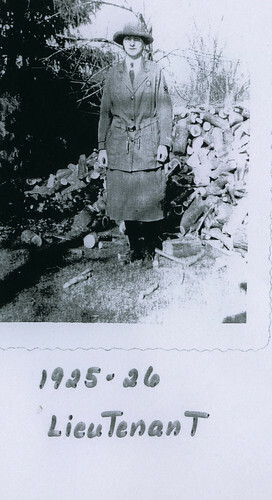 Past Patterns #126 is a May Manton uniform. Is Past Patterns going to also publish the Yeowomen/Norfolk jacket pattern, or is that from G.S. Headquarters? Thanks again.